New for 2016 Namm Show release. 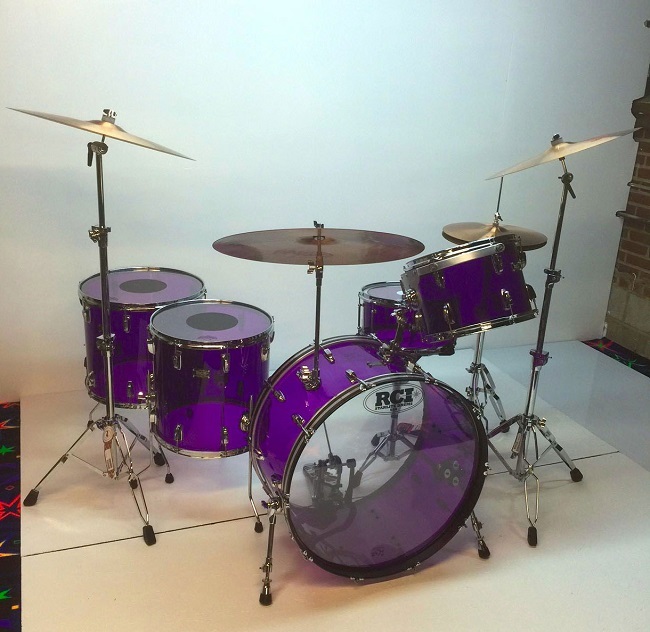 Its the 2016 "RCI Starlite Zep JB Kit in Purple Starlite Acrylic. This is part of the standard production RCI Starlite International Drum products for 2016. The kit is made from RCI Starlite Super Duty 1/4" shells which are made and manufactured in America at the RCI Starlite Manufacturing facility in Bridgeport, Connecticut. 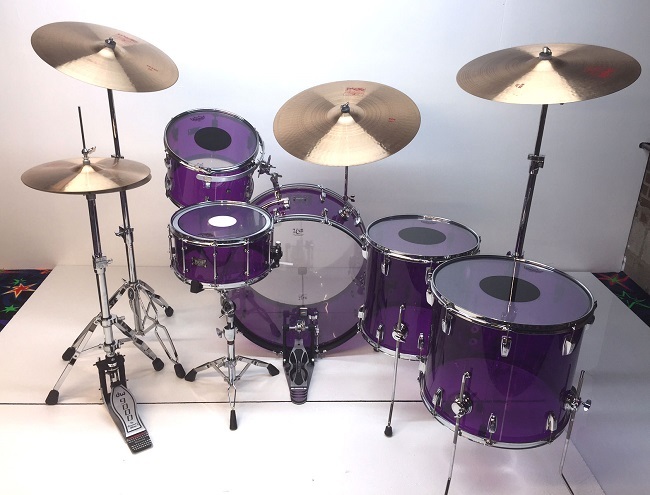 The kit is available in the sizes below and has 2 different configurations that include a (Depth x Diameter) 16x16 and 16x18 Floor Toms in the standard kit or the optional kit with 16x18 and 18x20 floor toms. Additional features on the RCI Starlite Zep JB kit are an accurate reproduction RCI Starlite Rail consollette on the bass drum along with a heavy duty Cymbal L-arm with memory lock. The drums are equipped with Remo performance CS Black Dot heads on the rack and floor Toms and an Aquarian Superkick II bass head for the batter or CS Black Dot bass Batter head and single ply clear resonate heads for the bottom of the drums. The kit also has an RCI Super Duty 7x14 Snare drum with full length tube lugs, Trick Strainer and RCI Super Duty IV 24 Strand Snare wires. The snare is cable of delivering a wide variety of deep tones to high pitches with its superior shell, bearing edges and head combination without putting to much tuning pressure on the lugs and shell. 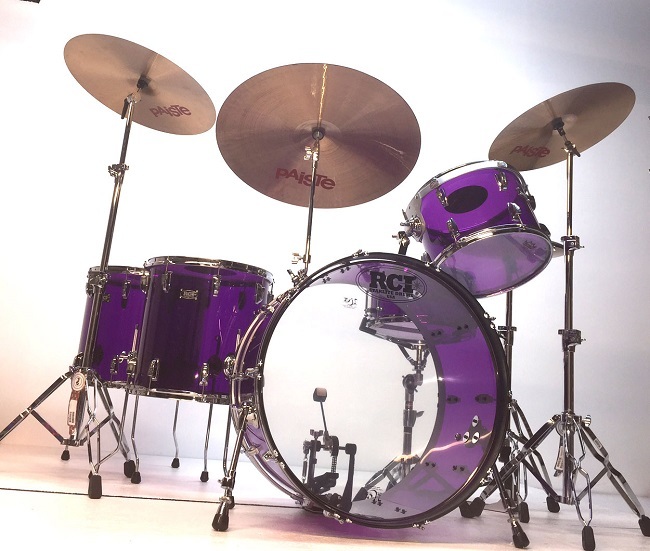 All RCI Starlite Shells are machined with RCI Starlite glass bearing edges that are machined and hand fabricated to deliver the most optimal sound out of our acrylic drums. The set is a high quality repro of the 1973 LZ tour Amber Kit using 2 floor tom configurations during the most memorable summer dates at Madison Square garden. Our quality repro is not lacking the detail that some of the other repros out there do. The 10x14 is a 6 lug unit with a mount. At RCI Starlite we have made the 10x14 Rack tom a virgin unit and used a high quality gauger rims mount system to acquire more tonal sound of the original sized Rack tom. Next there is the Rail consollette. This is an awesome reproduction made by RCI Starlite International and is painstakingly reproduced. The cymbal L-arm is a heavy Duty Gibraltar unit that can handle the likes of a heavy 24” Paiste 2002 ride Cymbal and also has a sturdy memory lock so you do not loose position as well as a very heavy duty mount to accommodate the weight. One big thing to consider about this set is that all shells and construction and assembly are made in America in Bridgeport, Connecticut. On big note here is that other JB repros are made in China and badged with a famous American company. These drums have the Spirit of Chicago written all over them. RCI Starlite International is an American Manufacturing company that produces high quality Acrylic percussion products, Microphone stands as well as wood, plastic, leather and metal goods. RCI has a full machine shop & foundry. We have supplied the most celebrated musicians and drum companies in the world since 2005 with our handcrafted Super Duty Shells. We are the acrylic back bone behind Drum companies such as DW, C&C Drum, Canopus SJC, Truth, OCDP, Pork Pie, Premier, Pearl, Taye etc. Great performers to name a few have been: Jason Bonham, Mike Palmer, Zac Starkey, Tommy lee, Ginger Fish and many more. RCI Shells are welded at the seam to be air and waterproof.